On November 5, 1916, two boatloads of workers and members of the IWW (Industrial Workers of the World, often called "Wobblies") traveled from Seattle to Everett to hold a free speech demonstration in support of striking shingle mill workers in Everett, and in support of First Amendment rights. They were met at the dock by local police, hired guards, and citizen deputies. Shots were fired, fatally wounding or killing outright five “Wobblies” aboard the steamer Verona. Two deputies also died on the pier, apparently shot in the back by their comrades during the fusillade. 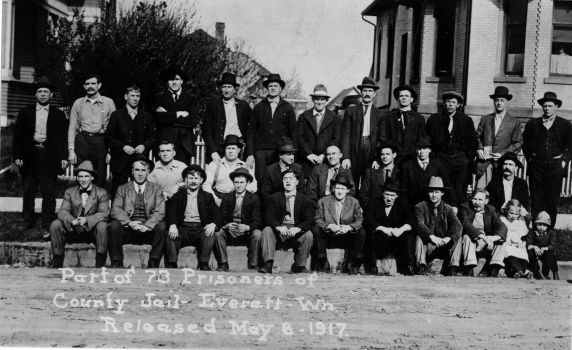 Seventy-four Wobblies were arrested on their return to Seattle and IWW leader Thomas H. Tracy was charged with murder. All were later released. Tracy was acquitted on May 5, 1917. Members of the IWW saw this as an opportunity to organize and provide support to striking workers (organized not by them but by an American Federation of Labor union). They went to Everett to speak in support of the strikers, and against the mill owners and the economic system they represented. Many heads were banged, teeth loosened, and a serious beating had taken place at the Beverly Park Interurban Railway station on October 30, 1916. The Wobblies planned a return visit for Sunday, November 5. The first of their two vessels, the steamers Verona and Calista, was met at an Everett loading dock by County Sheriff Donald MacRae and his businessmen's posse. The sheriff called out, "Who are your leaders?" The entire boatload of Wobblies aboard the Verona yelled back, "We all are!" Then someone (never identified) started shooting and five workers on the boat soon lay dead or dying. Probably another dozen were shot in the water after the boat pulled hastily away. Two businessman-deputies on the dock also died from shots in the back. Seattle police arrested 74 Wobblies upon their return to Seattle and charged Thomas H. Tracy with murder. The IWW launched a national defense fund campaign and retained Los Angeles attorney Fred H. Moore and former King County prosecutor George F. Vanderveer (1875-1942), later anointed "Counsel for the Damned" because of his advocacy of unpopular clients and causes. After a stormy two-month trial, one of the county’s first juries to include women acquitted Tracy on May 5, 1917. Lowell S. Hawley and Ralph Bushnell Potts, Counsel for the Damned (New York: Lippincott, 1953).